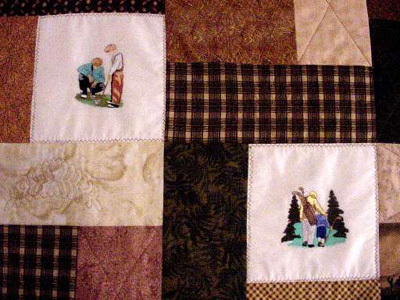 My name is Cathy and I had the pleasure of meeting you at the Ashville Quilt Show in August of 2005 and I went to your lecture about your quilt design. I was very inspired and I wanted to share with you what I did. 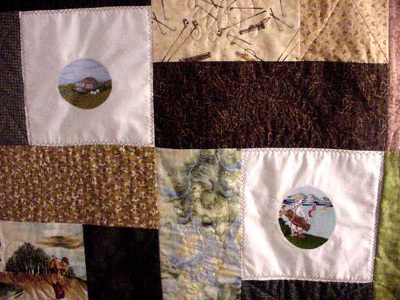 I took 10 squares of muslin and embroidered antique golfers and various golf motifs. I then found some applicable golfing material along with batiks, etc. My husband is thrilled with his quilt, as husbands don't get quilts too often. I'm now going to take your pattern and do one with Vizsla dogs (Hungarian Pointers) and hunting motifs for a charity quilt for rescue of this beautiful breed. 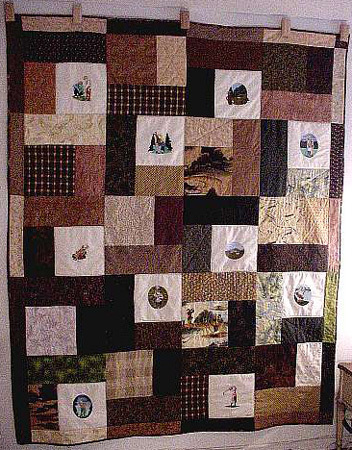 It will travel the Field Trial circuit for a year and people will buy raffle tickets and the drawing will be held for the quilt. We always have several pointing breeds at all events. Our club (Tampa Bay Vizsla Club) sponsors several AKC events and all proceeds will go to the rescue fund. I thank you for your wonderful pattern and look forward to your new books and patterns.